Regardless of how difficult a day the person has had, when he comes home he receives the warmest reception possible if he has a dog. However, having a dog is also a liability as they can be quite rowdy. This is where Richell Pet Gate comes in handy. For instance, when the pet owner has to go out, the dog can run amok in the house and start damaging things. The Richell Pet Gate with door takes away these kinds of problems. 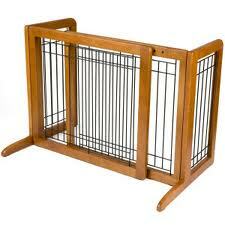 Even so, knowing more about this pet gate is crucial for a person planning to buy it. 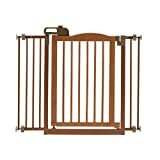 Here is a review designed to help buyers of Richell Pet Gate in Amazon. 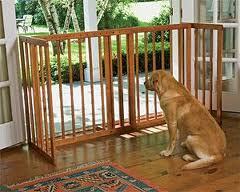 Why the Richell Pet Gate Works? There are more things that Richell got right with this pet gate than wrong. 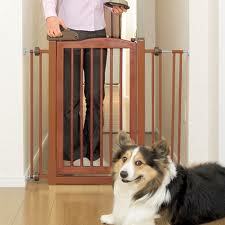 The benefits of buying this pet gate are many. Here is a list of a few of them. 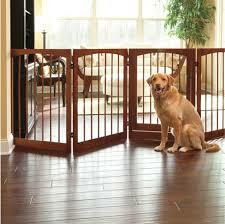 The best part of the Richell Pet Gate is that it is extremely solid and easy to install. In fact, it is so solid that it can handle the weight of a medium sized dog even when he climbs on it with two legs. The appearance of this product is very classy. The brown tan look fits in with most home designs and does not stand out as a major eye sore. This product is made up of a combination of wood and steel instead of cheap looking plastic. The gate of this product gets locked both at the top and at the bottom. This means that small dogs cannot push their way out from the bottom. There are three configurations that this product is offered in. These are 36 inches, 48 inches, and 60 inches. Effectively, this product can be installed in most standard door opening sizes. While this is an extremely well built product with the homeowners’ preferences in mind, it does have two flaws that a buyer needs to be mindful of. Consider the following. Even though this pet gate can handle most standard door openings, it would be unable to handle anything different from the norm. One convenience based problem that some users may have with this product is that its door only opens to about 110 degrees, as opposed to the much cleaner 180 degrees. This pet gate for small dogs is nearly perfect for dog owners looking to keep their pets confined. However, while buying this pet gate, the buyer should make sure that he would be able to use it by measuring the door opening well before the purchase. Moreover, buyers should be mindful of the fact that the Richell Pet Gate is built with wood and steel both, so that they are not under the impression that they are getting an entirely wooden product.